Real-time Pricing Data. 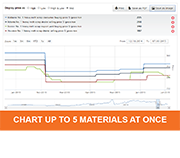 A complete price material library is available online with the ability to see monthly, weekly and yearly averages in Price Tracker. 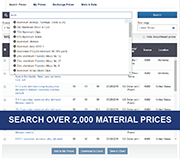 Fastmarkets AMM produces more than 1,400 proprietary material prices. Curious if we carry your material? View the full list of metals we price. Historic Pricing. Determined by your level of access, license holders can view one year or the full database of historic material pricing information. Authorization to view and chart historical pricing is available with a Professional license or a data license. Exportable Data. 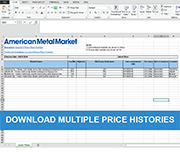 Download multiple material histories at one time in your preferred format whether it is daily prices or weekly/monthly/yearly averages. Scroll through data seamlessly, compare markets, or export the data to excel. Authorization to export our proprietary pricing is available with a Professional license or a data license. Seamless Charting. Chart up to 5 prices at one time then print or save as an image or PDF. Easily toggle or change date ranges and select the High, Low, High & Low or Mid price ranges you wish to view without leaving the search results. COMEX and LME Pricing. All of our subscribers receive access to COMEX 30-minute delay pricing, as well as LME official and unofficial previous day and 2-day comparison pricing. Fastmarkets AMM also carries Shanghai Futures last closing prices, exchange prices and NYMEX. Add LME Live to any license to receive LME Live 30-minute delay prices. My Prices. Save the materials you track most often to your personal My Prices tab to make your return to Price Tracker convenient and easy. Price Alerts. With email alerts, you'll receive live price change notices, so youre the first to analyze percentage movement on a price and identify opportunities. Set your price alerts for daily, monthly or when a price changes. With this early detection, you will be able to start planning and making decisions on how this may impact your business, current negotiations or long-term contracts. Learn more about all of the ways you can access our proprietary pricing with a data license. Pricing & News Your Way. Access all of our pricing and news online at amm.com. Login and surf the website to view pricing and material specs, breaking and top trending stories, as well as pertinent market stories to help you better understand where the markets are heading. News Alerts & Saved Stories. Know immediately when relevant news stories are posted about a specific keyword of your interest or select from our most-popular news categories. This service will help you be prepared of any changes in the markets you follow closely. Save articles to read again later or use to help reference for an upcoming meeting or report. Daily, Convenient Delivery. Each weekday, youll receive our daily electronic price report and market news in your inbox. Easily view the stories from your computer, OS smart phone, or download the full issue (as a PDF file) right from your inbox. Hand-Picked Daily News Highlights. AMM Daily consolidates the most crucial-to-read stories on the metal industry for you every day. Our news and prices are reported and compiled by an award-winning editorial staff with decades of industry experience and expertise. Trending Markets. Periodically, our price reporting team produces in-depth examinations with condensed pricing and news on trending markets. These market snapshots are added value for you and are included as part of AMM Daily. Some examples include: AMM Mexico  a weekly section covering pricing and news in the Mexico scrap metal market and HRC Index Report - a weekly price report included with our news about HRC fluctuations to explain the market more in-depth. You can access our news and pricing intelligence on your iOS devices and save the Daily PDF for offline reading. Your preferences will sync between your mobile and online use for convenient access to your metal needs. Download the FREE AMM iPad and iPhone apps from the iTunes store now. Understand the forces that drive markets, manage your material costs, interpret economic developments, and recognize factors impacting the metals supply chain with a license to Fastmarkets AMM. As a vital resource for news and pricing, perusing our price reports every day empowers you to make smarter business decisions. To see which license best fits your needs, call 877-638-2856 or subscribe online . Not ready to buy? Test drive Fastmarkets AMM for 14 days with a free access pass . Want to see an Fastmarkets AMM data license in action? Schedule a demo with our Customer Success Manager.